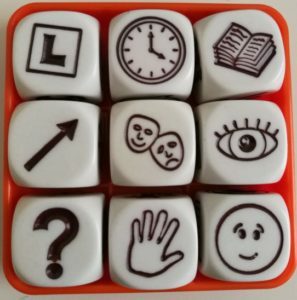 My sister got me some Story Cubes for my birthday last month. I’d played with some before, but never had a set to call my own. 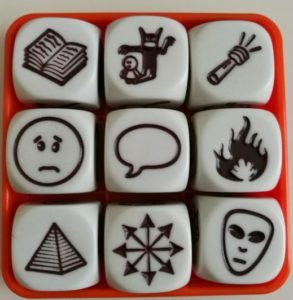 They’re great for playing little story-making games and just generally for helping ideas along. My mind jumped to the viva straight away! PhD candidates spend a long time learning enough to write their thesis. Things are going well, through good times and bad, then they look ahead and all they see is questions coming their way! Questions in the viva, questions about the viva, questions and questions and questions… But help is at hand. There’s lots of support. The end is a happy one. People look for patterns. We all carry mindsets of what we know or believe to be true. We tell a story based on what we’ve seen before. Even if you have some doubts about the viva, about the process, about how best to prepare – think about what you know from your research. Think about how you got to this point. I’m glad this doesn’t tell a viva story! Quick exercise for today: what would be on the cover of your thesis? What would it have to feature in order to communicate something of your work?